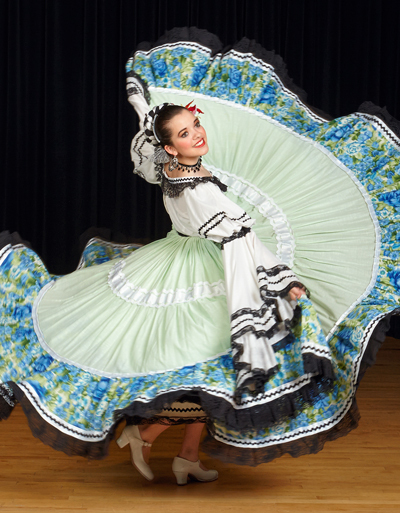 Aspen Santa Fe Ballet Folklórico offers many performing and educational opportunities. Each year, an annual recital showcases the entire program, providing participants with a chance to express their appreciation for the cultural dances of Mexico. Qualified students may be asked to join the ASFB Folklórico performance group or participate in other educational events that are held across the Western U.S. and Mexico. These have included performances at the Mexican Independence Day celebration with the Colorado Symphony organized by the Mexican Consulate in Denver. ASFB Folklórico has also been represented at national and international folklorico conferences in Las Vegas Nevada, and Hidalgo, Mexico to name a few. Over 160 students from Rifle to Aspen come together to perform original choreography inspired by the traditions of Mexico. This performance showcases the students of our acclaimed after-school program, designed to enrich the lives of children and inspire a new generation of creative thinkers and artists. Be carried away by the vibrant culture, color, and infectious energy of Aspen Santa Fe Ballet Folklórico!